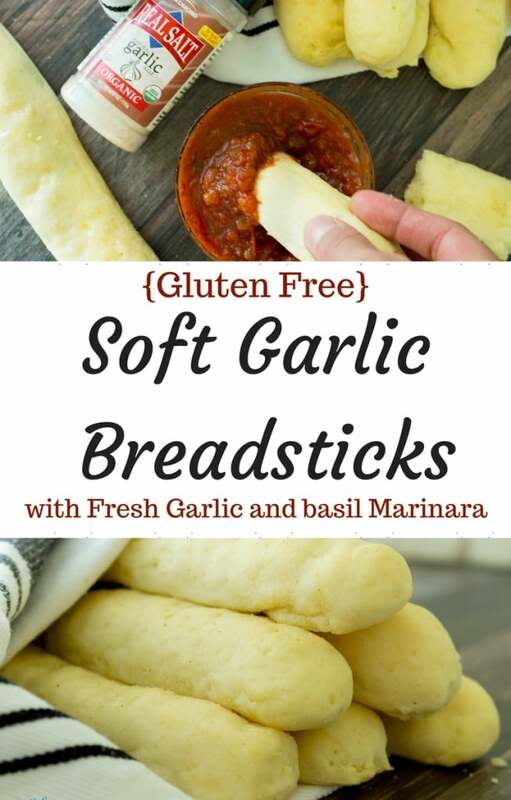 Soft and fluffy gluten free breadsticks brushed with olive oil and natural garlic salt, these are the perfect addition to any meal! From start to finish, you’ll have them on the table in less than an hour! This post was sponsored by Redmond RealSalt. As always, I only work with brands I love and use in my own kitchen. 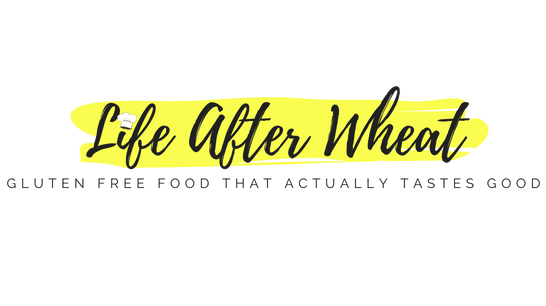 Thank you for supporting Life After Wheat and brands I partner with! This post may also contain affiliate links, please see my full disclosure. 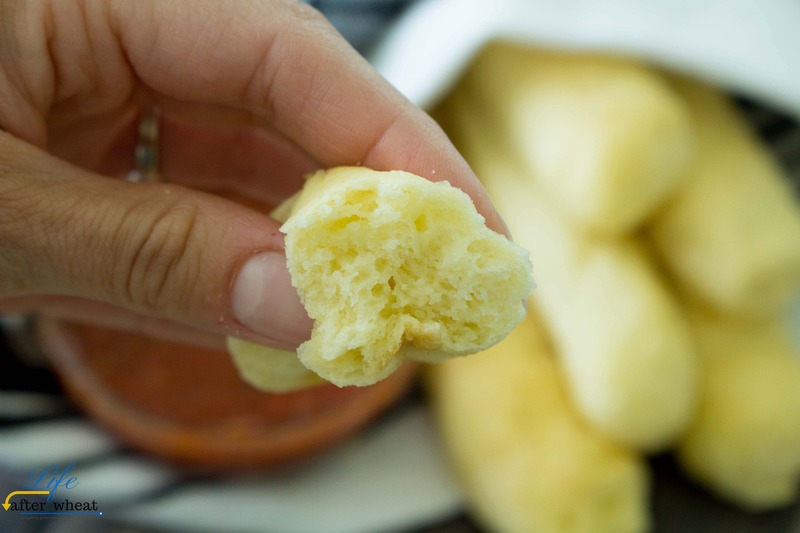 Today I’m excited to share one of my family’s newest favorite recipes with you: perfectly soft gluten free breadsticks seasoned with garlic! A few months ago, I learned of a local product called Redmond RealSalt. I had seen it on local supermarket shelves, but didn’t know much about it. I mean, salt is all pretty much the same, right? Sure I have a collection of sea salt, Himalayan pink salt, low sodium salt, and plain old table salt that I switch up depending on what recipe I’m preparing, but I’ve never found a particular brand of salt that I would buy over another. When I first tasted RealSalt, I was blown away. It really tastes different than any other salt I’ve eaten! I love that RealSalt products are collected from an ancient sea so they are free from pollutants. They’re also unrefined, which means you’ll find a bit of natural pinkish-red coloring and lots of trace minerals-something other salts are lacking. These two factors are what produce such a uniquely pure and slightly sweet flavor you won’t find in any other salt. Redmond sells quite a few natural products, including toothpaste, bath salts, food grade clay, hand soap (it smells amazing and doesn’t dry out your hands!) and, of course, lots of salt-based seasonings. Click here to see Redmond’s full line-up of products. I’ve fallen in love with everything I’ve tried, but the garlic salt is definitely my favorite. It has just the right proportions of savory garlic and sweet natural RealSalt. The first time I tried it, I knew it would taste perfect with breadsticks, and ohhhhh was I right! If you’re a garlic lover, you will swoon over these soft (yes soft!) gluten free garlic breadsticks with fresh marinara dipping sauce. Both the breadsticks and the marinara are flavored with – you guessed it – Garlic RealSalt. Chances are one of the things you miss the most since beginning a gluten free lifestyle is the bread. Sandwich bread, bagels, breadsticks. Right? It can be so hard to find recipes and products for gluten free breads that are soft, pliable, fluffy, and have a great flavor. This recipe was truly a labor of love. 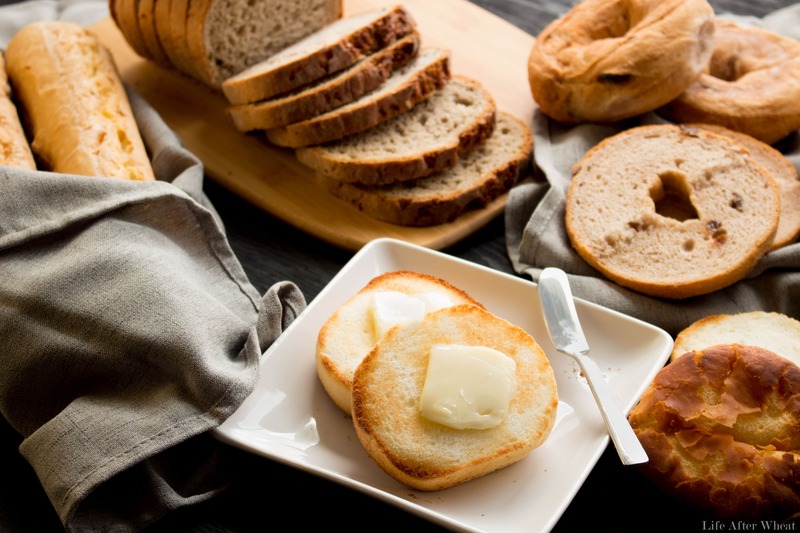 Creating great tasting gluten free bread products isn’t always an easy feat, but we did it! Since perfecting the recipe we have already made 3 batches. The kids gobble them up and, of course, my husband is always eager to eat them straight out of the oven. These gluten free breadsticks literally disappear! 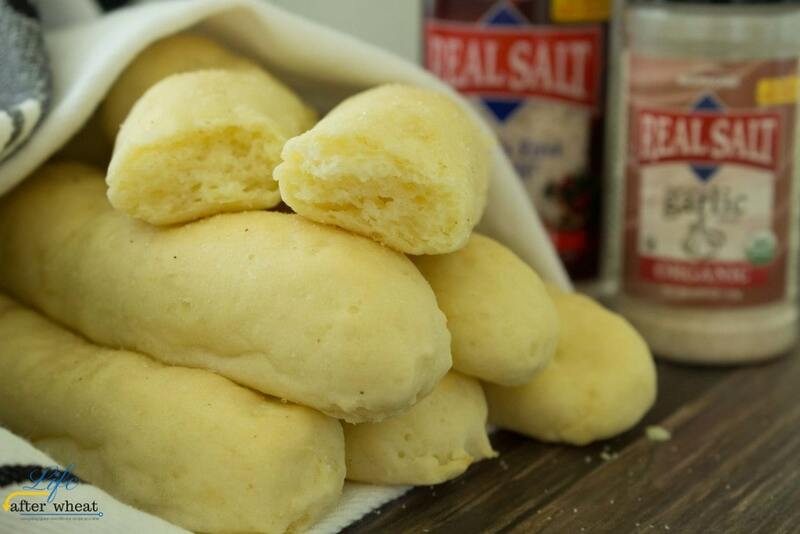 They’re also incredibly easy, and if you use instant yeast they can be prepared and baked in 30 minutes flat. Enjoy them plain or dip them in the easy marinara recipe below. Either way, I know you’ll love them! Flour matters. I say this often, and it’s true. Gluten free flours are all different and yield different results for different recipes. I used gfJules for this recipe. If you don’t have any on hand, I would recommend trying Better Batter, Gluten Free Mama’s Almond Blend, or the homemade recipe I have here on the blog. And while I think Cup4Cup flour is a great option, I have tested it out with this recipe and the texture wasn’t as good. Be careful not to let the breadsticks rise too long. If they do, they’ll deflate while cooking and will look and taste a little different (they won’t be as pretty). 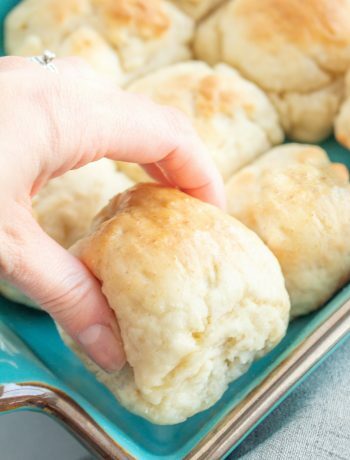 If you’re using instant yeast and letting them rise in a warm oven (see recipe), they should rise enough in just 10 minutes. Watch them closely! Combine all ingredients in a small saucepan and simmer about 30 minutes, until thickened. Start the marinara before you make the breadsticks and they should be ready about the same time. Line a baking sheet with parchment and brush with a small amount of olive oil. In a 2 cup measuring cup, whisk together yeast, sugar, and warm water. Let stand 3-5 minutes until bubbly and almost double in size to activate the yeast. While yeast is proofing, add gluten free flour, xanthan gum if needed, RealSalt, and baking powder to the bowl of your stand mixer (or a large bowl) and mix with paddle attachment or a spoon until combined. When yeast mixture is ready, add it to the flour mixture along with the egg, olive oil, and vinegar. Mix on medium speed (high if using a hand mixer) for 3 minutes. 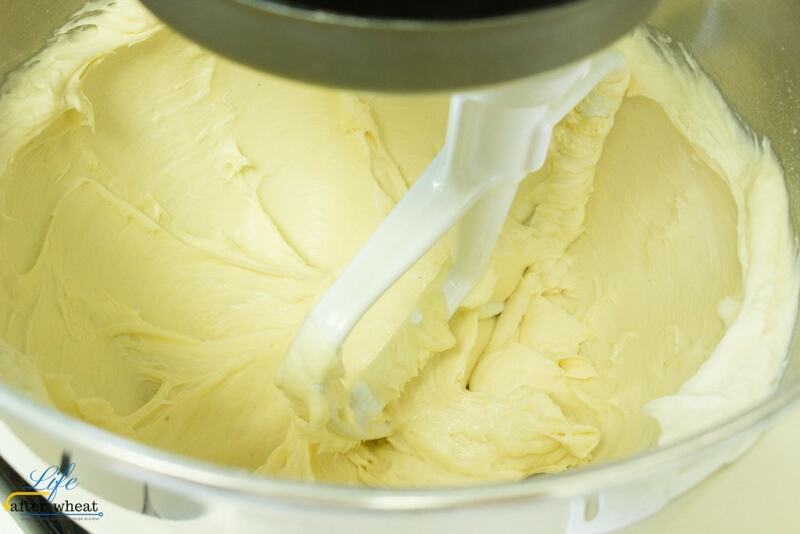 The dough should be smooth and too sticky to handle with your hands unless they are well greased. With a spatula, scoop dough into a gallon size Ziploc bag, then cut a 1" diagonal line across one corner (not a corner with a zipper). 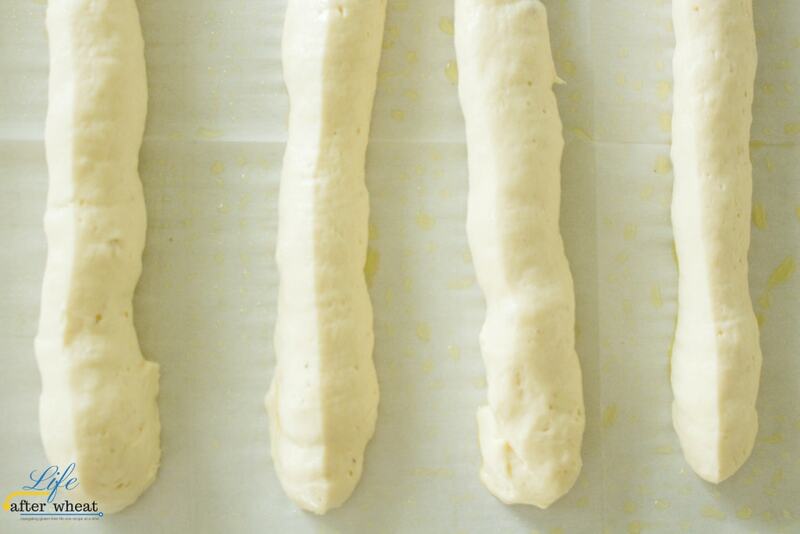 Pipe dough onto your prepared baking sheet, leaving about 1 1/2"-2" between each breadstick. You should have about six 9" long breadsticks. Put baking sheet in a warm place to rise. I heat my oven to 100 degrees F then turn it off and put the breadsticks in. Allow breadsticks to rise for 10 minutes, until they've increased in size about 50%. They will continue to rise as the oven is preheating and if they rise too much, they will deflate some while cooking. After they've risen 10 minutes, gently remove the pan from the oven and preheat the oven to 350 degrees F.
Once oven is preheated, bake the breadsticks for 10-12 minutes (it took 12 in my oven). The breadsticks should be a light brown color underneath. Whisk 1 T olive oil and RealSalt Garlic Salt together in a small bowl. Brush this mixture over the breadsticks until you have used it all. Sprinkle with additional RealSalt Garlic Salt and serve. These breadsticks are best warm, but can be stored at room temperature up to 3 days. You can re-warm them in the microwave for about 15 seconds to improve texture after storing. These turned out well. Did not use the resalt as I didnt have it available….substituted salt and brushed top with melted butter, garlic powder, a sprinkle of oregano and parmesan cheese. Also, I use my own flour mix…. Thanks for letting me know Laura, I’m so glad you enjoyed them! I love the cinnamon sugar idea, definitely going to try that! You have really outdone yourself with this bread stick recipe!!! I can’t wait to try those. And I have some Redmond products to use.. Whoop!!! Wow thanks Chrystal! 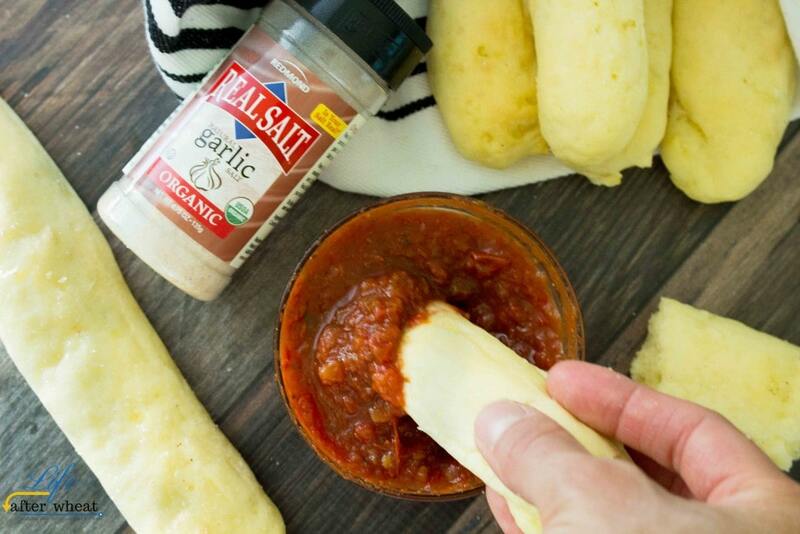 I’m excited for you to try them…FINALLY a soft gluten free breadstick, we’ve missed them! Is there a chance to just use arrowroot powder or coconut or almond Flour? We can’t really handle the pre mixed gluten free flours! So we are wheat and grainfree! Hi Agnes! 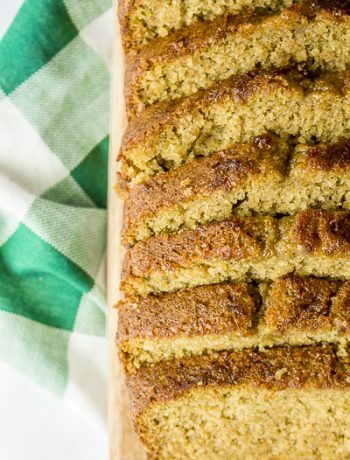 I haven’t tried this recipe using only grain free flours so I’m not sure how it would affect the texture. Agnes I’ve never tried it. I’m sure the texture would be different but I can’t tell you exactly how it would turn out. I don’t think coconut flour would work at all, but maybe a combo of arrowroot and almond? If you try it, let me know! I love Redmond’s Real Salt. 🙂 And I can’t believe how soft and squishly delicious those breadsticks look! Thanks Raia, we could eat these for day! And RealSalt is definitely a favorite at our house! Amen to the soft and squishy. My 8 year old said the tasted just like a pizza parlors! Win for mom! I can’t wait to try the salt! and I love gfjules flour as well, those breadsticks look amazing! You will love RealSalt Amanda! I’m excited for you to try them. SWOON! These look EXACTLY like the Olive Garden breadsticks that I used to loooooove (and eat about 10 of in a sitting haha). Can’t wait to try these!!! Leah, you’re going to love them, we’ve been baking them several times a week! These sure look good, Celeste. Thanks for including all the tips; gf baking is tricky. True that Barbara, took me a few tries but it was definitely worth it! These look amazing! I wish I had some to enjoy today. I’m going to have to make these soon. These look delicious! I miss a fluffy garlicy breadstick! So did we, you will love these! RealSalt adds the perfect flavor, too. Thanks so much Heidi, it had been a long time for us too! And yay for RealSalt, it’s definitely a winner! Those look perfectly soft! I can’t wait to try these! I have two daughters that are celiac and husband is gluten intolerant. These turned out absolutely brilliant. They loved them and have requested them as a regular addition to our menus. Thank you so much for bringing joy to a very restrictive diet. Thank you so much Susan! Hearing things like this make what I do worth it ? Have you tried this recipe with the other blends besides GF Jules? I don’t keep commercial blends on hand as I make my own mixes. 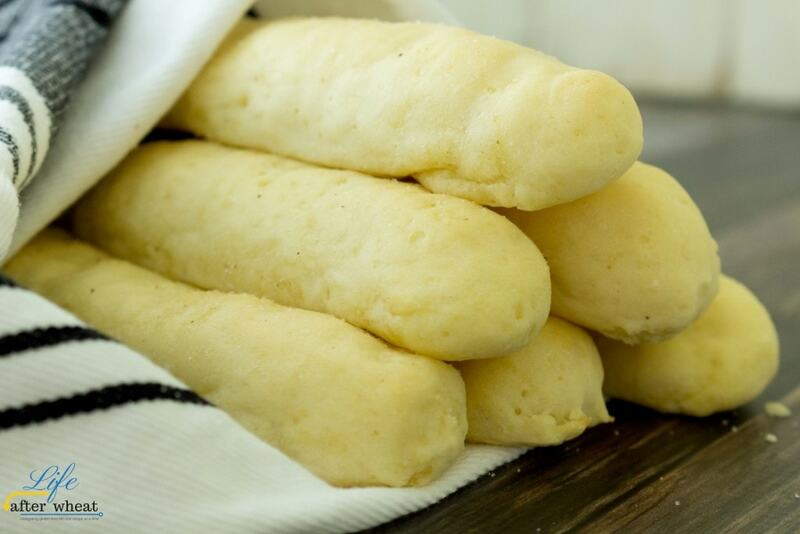 I’d like to try these breadsticks following your flour blend recipe–but not if you haven’t don’t it yourself. I use my mix in a similar recipe so it should work great! Just use 1 1/2 cups of my flour mix + 1/2 cup potato starch instead of the 2 cups flour. Happy baking! Thanks! If I have time, I think I’ll try these tonight. I used Namaste flour, these were just as promised soft and fluffy!! OMG keep the recipes coming gluten free bloggers! You’ve kept hope alive for those who suffer from the tasteless wasteland of GF fails lol You are truly loved for your efforts! Cup4Cup GF flour comes with Xantham gum already in it, so I wouldn’t need to add the additional Xantham gum, correct? Also, I’m allergic to vinegar. Would another acid, like lemon juice work since it calls for so little? Or would I be better off just leaving it out? Hi Melaney! You should be able to use lemon juice or omit the vinegar. And while I love Cup4Cup flour, I tested this recipe with it and the texture wasn’t as good. I recommend gfJules or Better Batter, and do keep gfJules on hand at all times for all my yeast bread recipes. You can find it on Amazon and get 2 day shipping if you have Prime. If you’re using Cup4Cup, I would half the xanthan but, again, I would recommend using another blend. Hope you enjoy it! Decided to make these and kept my hopes low because gluten free baking is so unpredictable. I just made these and am already on my second one. So I am now going to make another batch. They are soft and wonderful tasting just like real bread. I did change a bit and used Bob Red Mill flour, homemade apple cider vinegar and corn oil. Mainly because that was what I had on had. I was able to roll out my dough for some reason. But I am not complaining!! Excellent and easy recipe to follow. I thank you so very much for posting this recipe. I must’ve done something wrong! Followed the recipe exactly as you had it and the dough came out very crumbly (used your flour mixture recipe with xanthum gum). I added probably another 3/4 cup water to make the dough smooth like in your picture. Piped it out and let it rise 10 minutes and it looked GREAT!! Then baked for 21 minutes (they were still pale and flat after 12 minutes). They came out brown then deflated, then were absolutely gummy. HELP!! My daughter is new to gluten free and I’ve got to find a solution!! Thanks! Has anyone tried this recipe with an egg substitute? I have intolerances to eggs, gluten, dairy, and shellfish. 🙁 Do you think a flax or chia “egg” would work since it has the xanthin gum in it already? Do you mean all purpose flour? Mine has zantham gum already and baking powder. Would I omit the BP as well? Thanks! Nevermind. Mine had SODA. so I still used powder and they turned out great. So addictive I ate my the ones I had set aside for my grandpa! I made these last night for my parents (who have Celiac disease) and they turned out great. I was very surprised and impressed. First time I have had gluten free bread turn out well. And it was so simple and quick to make, too. The breadsticks are soft and have a nice crumb texture. I put the broiler on for two minutes at the end to give the tops some extra browning and they looked great. Also, I was able to shape the dough with slightly oiled hands, saving the zip-lock step. I even made a small bun. The taste is pretty good. There was a slightly “off” taste. Sort of salty, or bitter. Might be from the flours and starches? My dad said it was great with some butter. Probably not as noticeable with a dipping sauce of some kind. He’s happy, so I’m satisfied. Thanks for a great recipe. It should help my parents a lot. Absolutely recommend this one to anyone needing a gluten-free solution to their breadstick cravings. Thanks for the shout out and these look GREAT! Delicious! Finally a gluten free breadstick that tastes like Olive Garden breadsticks! 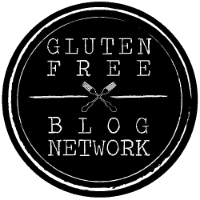 My daughter and I have celiacs so we have been looking for good gf bread recipes. This one is fantastic! We used King Arthur gluten free all purpose flour and kosher salt. Are these breadsticks okay to freeze so that they can be baked ahead of time and saved until needed? Hi CJ! As with all baked goods, these breadsticks are best eaten fresh. However, they warm up pretty well 🙂 You can bake, cool, and freeze, then reheat when ready to enjoy. These would be great for enjoying with a large party. May just have to put these out with pizza for our Super Bowl menu!